TYCHON provides enterprises with a unified and streamlined user experience for asset identification, software inventory, endpoint configuration management, and real-time compliance tracking. 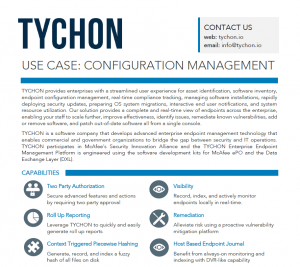 Utilize the TYCHON Enterprise Endpoint Management Platform to manage software installations, rapidly deploy security updates, prepare OS system migrations, customize interactive end-user notifications and manage system resource utilization. Our solution provides a complete and real-time view of endpoints across the enterprise, enabling your staff to scale further, improve effectiveness, identify issues, remediate known vulnerabilities, add or remove software, and patch out-of-date software all from a single console. TYCHON has a DVR-like capability for client or server, physical or virtual endpoints that provides an always-on endpoint monitoring, recording, and indexing capability. TYCHON generates, records, and indexes a fuzzy hash of all files on disk providing comprehensive searching and rapid termination for variants of IOCs and vulnerabilities yet to be discovered. TYCHON provides a proactive vulnerability mitigation platform that alleviates risk by informing users with an actionable dashboard of the wellness of the enterprise.